Golfing, Biking, Beaches, Casinos, New Orleans! No cleaning fees for next 24 hours, Plus Save an extra 15% on a weeks stay! 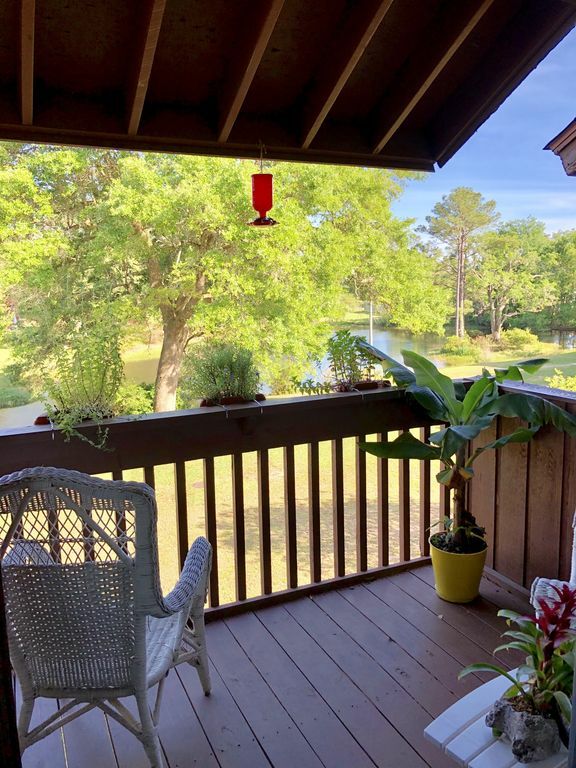 Come enjoy the best white beaches, biking, golfing, shopping, at this newly retrofitted adorable, relaxing, lakeside, golfing, Diamondhead studio! Endless amenities, and close to white sandy beaches, casinos, shopping, and great seafood restaurants! Minimum down payment reserves the special vacation you’ve been dreaming of! Steps to two18 hole golf courses, swimming pools, restaurants, entertainment, biking and tennis! This adorable retrofitted studio has it all! Luxury queen and single beds. No sofa sleeper here! Free coffee, high speed Wifi, Smart Vizio TV with Netflix options, fully equipped kitchen, large soaker tub, and a private deck overlooking the lake. Everything you need to enjoy your stay without the price tag! Small towns of Bay St. Louis, Pass Christian, and Gulfport airport close by. Biloxi and Gulfport close by to the east and only 50 minutes away to New Orleans! Take a nice day trip without the hassles, and expense of the city! Come back and relax in your quiet and comfortable abode! Access to the best white sandy beaches, fresh seafood restaurants, charter fishing, antique shopping, festivals, equestrian activities, Shuckers baseball, Casinos and so much more! This comfortable, quiet, relaxing abode can be yours, at a great price, in a central location with easy access to 1-10. Perfect for a relaxing stop over, or extended stay. The Coast is your oyster at an affordable price! LOCATION: Sits right next to the Diamondhead Golf and Country Club with views of the lake from the balcony. THE PROPERTY Studio: This cozy studio is the perfect escape from everyday life. After playing a round of golf, or winning that tennis match at the neighboring country club, cool off in one of the five pools in the area! Prepare dinner in a full sized kitchen, and enjoy your fixings with a glass of wine on the back patio, featuring views of the water and surrounding grounds. Watch the lightning bugs dance around as the sun starts to sink beneath the horizon. Before heading off to bed, relax in the soaker tub and think of the adventures tomorrow holds. AMENETIES: In just about a 2-minute walk, you’ll find the clubhouse and golf course where you can hit complimentary drive balls, or practice your putting. The Country Club offers trivia on Wednesdays, karaoke on Thursdays, and steak dinners on Fridays. There is a local bowling alley for entertainment and kayaking is also available. Thirty minutes away is the Gulfport Harbor where you can hop on the Ship Island Excursions. The hour-long ferry ride will take you to West Ship Island and Fort Massachusetts. The day trip is perfect for history buffs, and people wanting to experience some of the most excellent beaches on the Gulf Coast. Just 15 minutes away lies the small seaside town of Bay St. Louis. Here you can explore Old Town, enjoy Cajun cuisine, and pursue the many antique shops. Want to take a local swamp tour, only 30 minutes away. Everything you could want in a safe, quiet, convenient location! MISSION: A percentage of revenue generated from this condo rental goes to international missions outreach. Current missions support includes a young college student in Cuba, and an elderly lady in Cuba and India, and Mercy Nursing Home residents in Kodaikanal, India that have no family. The average income for these groups is less than $1 a day, so any little bit helps met the basic necessities of life. I have personal contacts with these groups, and can assure you they go directly to the people, and they are the most appreciative people you will ever meet! Thank you for your support and helping the least of these! The condo is also used as a International House of Hope, for those contacts who are able to visit the US for a short visit from other countries, free of charge. It is meant to inspire and give them hope for a better tomorrow. Together we can make a difference, one person at a time! This condo was purchased to offer hope to the less fortunate in other countries. A percentage of all rental proceeds goes to missions outreach where I have personal contacts in Cuba and India. My supplemental support helps them meet their basic necessities, and gives them Hope for a better tomorrow! With the additional revenue generated, my goal is to extend my outreach to others I meet along lifes’ journeys. Price, quiet, safe, comfortable, resort location, easy access to 1-10, beaches, country club, great restaurants, pools, and good Ole Southern hospitality! Newly renovated studio with 2 comfortable beds, free coffee, fast Wifi, Vizio Smart TV, quiet, peaceful, and steps to two 18 hole world class golf courses, clay tennis courts, and a short drive to the beautiful white sandy beaches for a great price! Easy access off of 1-10 to New Orleans, Coast Casinos, Stennis Space Center, beaches, shopping, restaurants, and so much more..... Once you come I promise you won’t want to leave! A percentage of every nights’ rental goes to help others around the world, who can only dream of the life and privileges we have here in the US! When you stay here you are helping to spread love around the world! Thank you for choosing to book here, and be a blessing to others! Large soaker tub and shower, to leave all your stresses behind! Steps to Diamondhead Golf and Country Club. 15 minutes to Hancock County Fair grounds. Lakeside view from private balcony. Large parking lot in from of the unit. Small coffee maker with coffee, filters, cream and sugar available. Bottled water and paper towels are provided to get you started. Full kitchen with full size refrigerator and stove. Dishes, pots and pans, oil, salt and pepper. Small deck overlooking the pond. https://diamondheadms.org/tennis/ First rate clay tennis courts. $10 guest fee. Sunday round robin 2pm and daily clinics available. Call for details. #1-228-255-5030. Small salt water pool at complex open year round, but not heated. Large Olympic pool with kids play fountain, 2 minutes walk from the condo, open seasonally. Other pools throughout Diamondhead. Situated next door to the Diamondhead Golf and Country Club. Beaches, casinos, and Gulfport airport 15 minutes away. New Orleans 50 minutes away. Quaint towns of Bay St Louis and Pass Christian close by. Nice clean efficiency! Very responsive owner. Next door to clubhouse ! Thanks for your booking, and helping to spread love around the world! The condo was very quiet and peaceful. Connie is a great host, she makes sure that everything in the condo is going accordingly. Will love to come back to the place again! Awww that is so sweet of you to say Angela! Would love to have you guys back anytime! So good to hear Stacy! You’re welcome anytime! Perfect guests! Connie was the most gracious host. She was very thoughtful and supplied the majority of everything needed! She even reached out a few times to make sure we had what we needed to enjoy our stay. It's a quaint, quiet place for a couples low key vacation. We enjoyed the community of Diamondhead and the close proximity to the country club. Everyone was very friendly and hospitable. Close enough (for us) to beaches, Biloxi, Gulfport and more. Thanks Gigi. You and Mark were the perfect guests! Glad to know you made it home safely! Set in a resort community close to 1-10 makes this location ideal for the traveler who wants to stay for a night, or spend a weekend playing golf, going to Casinos, or a week at the beach. Minutes to Bay St. Louis, Waveland, or Pass Christian. Biloxi 20 mins away. For horse enthusiasts Hancock and Harrison County Fairgrounds are 10-15 mins away.